One of the most powerful ways to grow your business and outsell your competition is to get more positive online reviews. 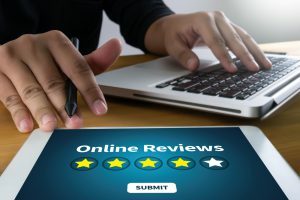 Reviews are getting increasingly important as consumers do research and seek reassurance before they buy a product online or stop in a retail business. Reviews are especially valuable for helping you rank and attract customers in local search. According to some research, each star in a review can result in between 5 and 9 percent increase in business. This is extremely significant and makes it worthwhile to investigate the best strategies for getting more reviews. There are two types of online reviews. First-party reviews appear on your own website. Third-party reviews appear on sites such as Google, Yelp, Angie’s List or other independent websites. Both types of reviews are important. Let’s start with the first party type. Aside from building confidence in your visitors, these reviews are also valuable for SEO. Here are a few guidelines for attracting and maximizing the benefits of first-party reviews. Ask all of your customers to leave reviews on your website. Remind them on your website, social media pages, via email and, if you have a physical business, in person. Publish all reviews. If you filter them and only publish positive comments, you’ll quickly lose credibility. Don’t incentivize. Don’t offer people rewards or discounts in order to get reviews. Reply to all of your reviews. Thank people for taking the time to comment, even if the review is critical. If you get negative reviews, address the issues promptly. Do whatever you can to make the customer happy. Reviews that appear on third-party sites are also important. Many customers use sites such as Google and Yelp as guidelines when choosing businesses, including restaurants, lawyers, accountants, medical professionals, and others. Many of the guidelines for third-party reviews are similar to the ones listed above for reviews on your own site. However, there are some differences as well. Make sure your business is listed with Google and any other sites that are relevant to your business. Google is especially vital if you have a brick and mortar business and want people to find you. While almost all types of businesses are now listed on Yelp and Google, don’t overlook specialty sites for your industry. For example, attorneys are listed on Lawyers.com and Avvo. Doctors are listed on Healthgrades. Monitor review sites carefully so you know when people leave reviews. Set Google Alerts or use some time of reputation management software or service so stay informed. As with reviews on your own website, always take the time to respond to reviewers. Thank people who leave positive reviews and do what you can to correct any mistakes. Some people will remove or update negative reviews when they see you care enough to address the issue. If you suspect a dishonest competitor is leaving fake bad reviews, notify the site. This doesn’t work everywhere but some sites, including Google, will remove dishonest reviews if you report them. Online reviews are now one of the best ways to build your business and stand apart from the competition. The best way to attract positive reviews is to offer outstanding products and customer service. It’s also essential to remind your customers to leave reviews. Invoice financing is a great alternative to bank financing. It’s a way to quickly improve your cash flow without incurring debt. It’s also an option that’s open to many businesses that might not qualify for bank loans. Riviera Finance, founded in 1969, is one of the acknowledged industry leaders for invoice factoring. They provide the highest cash advances in the industry with funding available within 24 hours.